Have you ever eaten something so good it stopped you in your tracks? When I was at the Fancy Food Show earlier this year I tasted one of the most incredible things in the world. It was Kari’s South African Tea Cake from Kari’s Desserts. This recipe I later discovered was passed down through the generations. Kari Mansfeld, the founder, like so many other female entrepreneurs in the gourmet food industry was working in retail when she decided to realize her passion. Kari was encouraged to start a business to sell the desserts she made for her friends and family at dinner parties. She “fell” into the gourmet food industry just out of passion for baking. I had never seen anything like what she made, and was absolutely enamored with the desserts I tried. I’m not the only one who has discovered Kari’s Desserts. Malva Pudding is the favorite dessert of Nelson Mandela. Art Smith and Oprah Winfrey’s personal chef. Women like Kari who take a big risk by leaving steady corporate jobs to pursue their passion are my heroes. She answered some questions for me at the Fancy Food Show. Check out our interview below. What got you interested in the food industry? I was never a very good cook – at least not in my opinion, and was very happy to source out easy and delicious alternatives to actually making something myself. But when I did cook, it was dessert as I always liked it. I served my desserts at dinner parties and finally enough foodie friends said that I should make it and sell it. I set about producing the first Kari’s Malva Pudding. 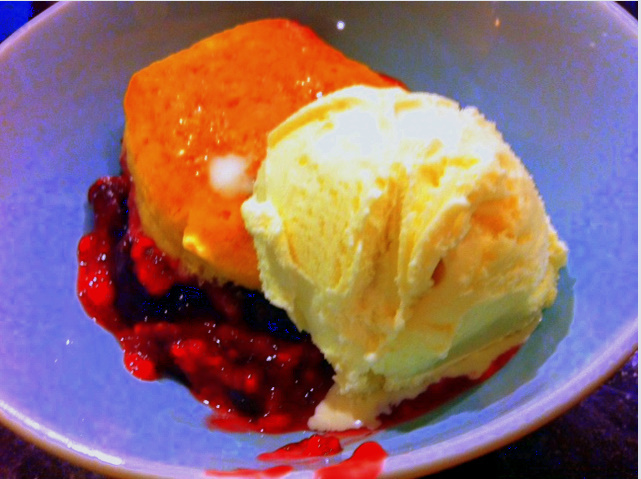 The recipes for Kari’s Malva Pudding and Kari’s Chocolate Malva Pudding are based on traditional South African recipes. It took a while to come up with one that really tasted just the way I liked it and came out consistent in production. The recipe for the Kari’s Fridge Cake is my granny’s. My granny used to make it and then my mother made it all the time, and I have been making it the same way my whole life. 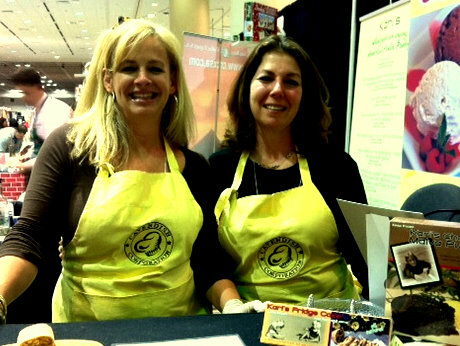 Kari, at the Fancy Food Show 2012, is on the left. Do you feel you were ever treated differently because you were a woman, in the U.S. and in South Africa? I do not feel really like I have been treated unfairly in either place, but have some simple observations. When I first started working in South Africa, I was designing bathing suits for a very large international brand in the South African division. I worked with all women on the textile end, but all men (with the exception of one secretary) on the footwear end. It never struck me as odd at the time, but I know that I would not have had the respect as a designer if I had been constructing the complicated athletic sports shoes – it was understood that I could make a bikini, but I would be out of my league with a rugby boot. Truth be told, I think we were all doing what we were best at, it just was very sexually divided. I never knew if the footwear designers were getting paid more or the same as I was. The administration in the company was all male. When I moved to the States, I also worked for a large sports company and the administration was all male with the exception of one woman. She definitely was constantly fighting for herself and as a result, was always under attack and scrutiny. The men in the office she reported to were always finding reasons to fault her methods. It was very hard for her. Now in the food industry, I have found that the male buyers are all more relaxed than the female buyers. The male reps do not work as hard as the female reps. People are very careful in the demographic where my products are sold (natural and specialty food stores) and I also believe that professional and working Californians in general are very conscientious and do their very best to be as politically correct, culturally and sexually accepting, and fair as possible. Although it is not the most important thing, I have been treated differently because I was a woman – In South Africa, a man will always hold the door open for a woman and have her walk through it first, but here in the States, he will not want to offend her, and may not do so as a result. You can find Kari’s incredible desserts at Whole Foods market. Follow Kari on twitter at @Karisdesserts. If you like mushroom flavored food, you will love this. If you don’t–don’t use mushroom broth, and you can make a variation on this lovely soup. 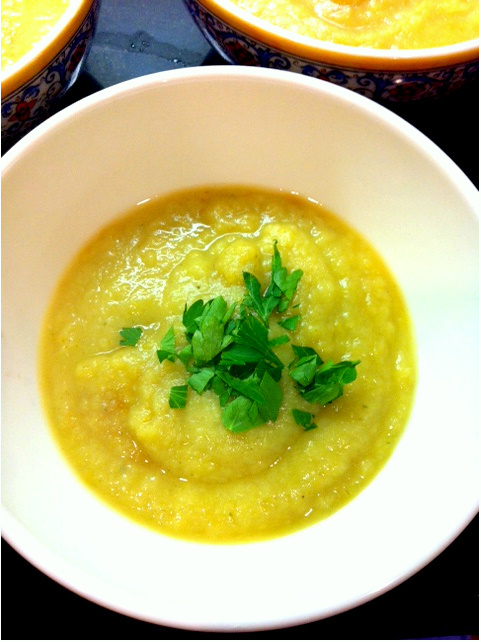 This soup is very easy to make, and satisfying. A vegetarian can substitute the chicken for tofu. 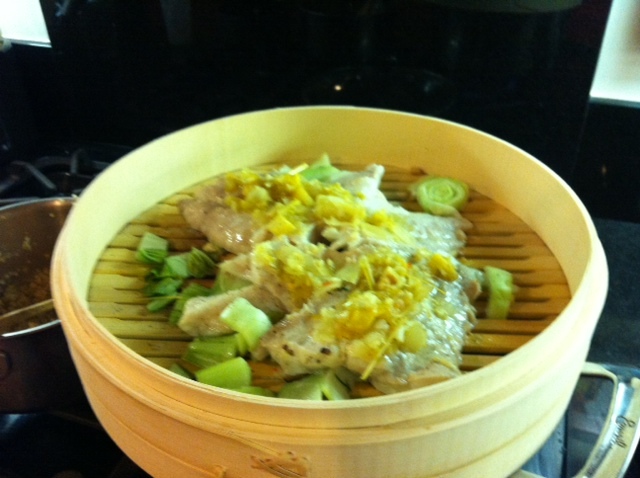 I recently made my first orange chicken dish–a healthy version. What I realized (perhaps a little late in my culinary career) is how chefs make the thick sauce for Orange Chicken–>corn starch. Corn starch is harmless in small amounts, however it has been used to make lotion. It’s not something you should consume large amounts of. That being said I’ve left it out of this recipe that I borrowed from Eating Well Magazine. Due to a lack of lo-mein noodles sold at Trader Joe’s this Asian-inspired soup I made with whole wheat noodles. Remember cooking rules are only a guideline, and they’re meant to be broken. This Shitake Soup came out thick despite the lack of cornstarch ingredient. Add all ingredients into the pot and let it sit for about 15 minutes. Then bring the broth to a boil and add the noodles. Let them boil for ten minutes until soft, and until chicken is cooked all the way through. Chop scallions (or green onions if that is all you have) and put a teaspoon over the top of the soup. Enjoy with a piece of homemade seven grain toast! No dinner party is complete without dessert. 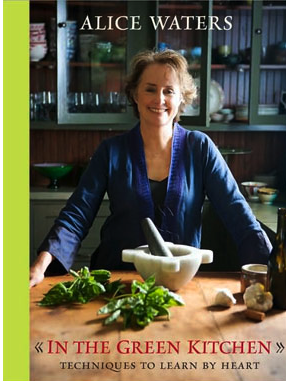 As a food lover and fan of Alice Waters, about six months ago I made a purchase on Gilt Groupe–it was a tour of the Alice Waters‘ Edible Schoolyard in Berkeley. I’m interested in sustainable farming, gardening and of course cooking so I thought it would be an adventure. I got a signed copy of Alice Waters’ new cookbook In the Green Kitchen. The book is laden with simple easy to make recipes. I chose two for our small dinner party last night. The cobbler recipes calls for two things I left out. Instead of using peaches or nectarines which aren’t in season, I opted for more berries. I replaced strawberries for the nectarines–a mix of fresh and frozen berries. I got meyer lemons from the farmer’s market which are the most beautiful type of lemons available. 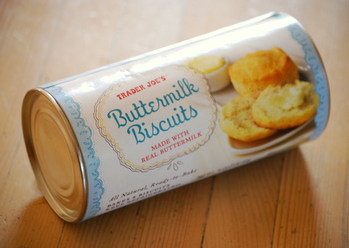 Please know, the recipe calls for fresh biscuits, but if you don’t have time to do everything please feel free to cheat by purchasing ready-made biscuits from Trader Joes. Shhhh! Prepare the biscuits in advance. Bake biscuits which are pre-cut for 18 minutes until browned. Cut them in half. Preheat the oven to 400 degrees. Combine the fruit in a large bowl. Mix 1/2 cup sugar, flour, and salt, and stir into the fruit. Add the lemon zest and juice, and mix well. Put the fruit in a large dish. Bake the fruit for 8 minutes or until the fruit just softens. Remove the dish from the oven. Brush the biscuit tops with the cream and sprinkle and sprinkle lightly with the remaining sugar. Place the biscuits on the fruit in rows and return the dish to the oven. 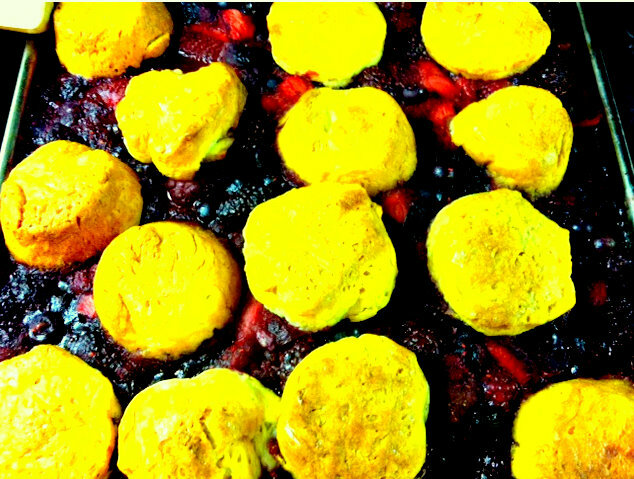 Bake the cobbler for 35-45 minutes, until the biscuits are golden and the fruit is bubbling. Let the cobbler cool and serve warm with vanilla ice cream. 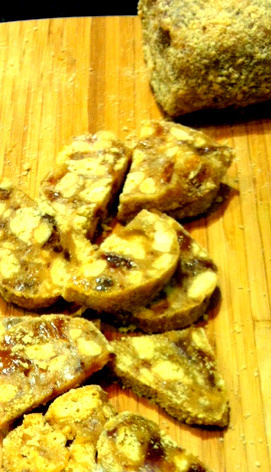 I altered the color of this photo, but before you serve the individual servings it should look somewhat like this. I love having people over, and chopping away on a Saturday after a day at the farmer’s market is a great way for me to get R&R. It’s mindless, and I had on NPR all afternoon. About six months ago I made a purchase on Gilt Groupe–it was a tour of the Alice Waters‘ Edible Schoolyard in Berkeley. I’m interested in sustainable farming, gardening and of course cooking so I thought it would be an adventure. I got a signed copy of Alice Waters’ new cookbook In the Green Kitchen. The book is laden with simple easy to make recipes. I chose two for our small dinner party last night. I made the potato-leek soup, my simple steak recipe, salad and berry cobbler for dessert. Let’s start with the potato leek soup. Leeks are in season, but I must have missed them at the Farmer’s market–I ended up picking them up at Trader Joe’s which I don’t recommend because they are three dollars a bag. French women appear to use them to lose weight, but I just think they taste wonderful. This makes about 6 servings. Prepare the leeks: Trim off the root ends and the tough upper green tops. Halve the white part of the leeks lengthwise and then, without cutting through the root end, cut lengthwise into 1/4 inch-wide strips. [Don’t worry too much about how you cut the leaves, because you will be blending them up eventually.] Wash the diced leeks thoroughly in a large basin of cold water. Once the dirt has settled, scoop them out with a sieve or strainer. Drain and set aside. Heat a heavy bottomed pot over medium heat. Add the olive oil or butter, followed by the leeks, thyme and bay leaf. Cook, stirring occasionally, until the leeks are tender, about 10 minutes. Peel the potatoes and cut them into 1/4 inch dice or slices. Add the potatoes to the pot and cook for three to four minutes. Pour in the chicken stock season with salt, and bring to a boil. Reduce the heat to maintain a low simmer, and continue cooking until the potatoes are tender, but not falling apart. Taste for salt and adjust as needed. Let the soup cool to room temperature, and refrigerate for several hours or overnight. 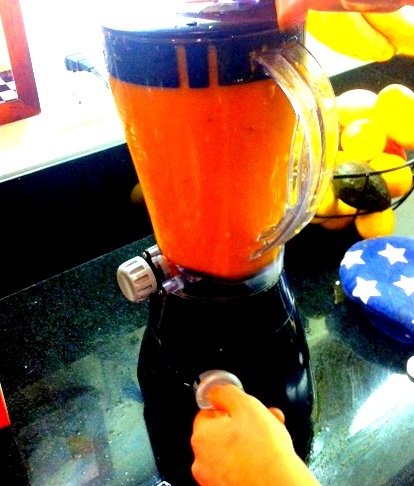 Puree in a blender or using an immersion blender before serving. 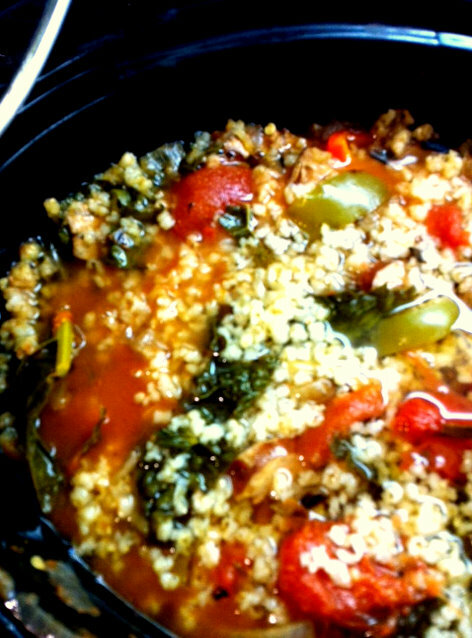 Before serving, remove the bay leaf and reheat the soup over medium heat and taste again for salt. If you like add a splash of champagne or white wine vinegar to sharpen the flavors. Stir in 1/3 cup heavy cream before serving. Ladle the soup into warm serving bowls. Finish with a few grinds of the peppermill, and garnish with chopped parsley or chives. While most people absolutely love the holidays, they aren’t always my favorite time of year. I wouldn’t call myself a grinch, but I find the energy can be a little crazy. The Christmas music, advertising, and holiday media tornado can be overwhelming. In reality a lot of us don’t have stress-free holidays. I love any reason to make a hearty soup. The soup I made yesterday I got from Oprah Magazine (the only “women’s magazine I tend to read). It’s a Kale Soup with Chicken Apple Chardonnay Sausage. It calls for Andouille Sausage but I changed the recipe. 1. Bring 10 cups water to a boil in large Dutch oven or heavy pot. Add kale and boil 5 minutes. Drain in colander and set aside. 2. In a pan warm olive oil over medium-high heat. Add onion to and cook until onion is translucent, 4 minutes, stirring occasionally. 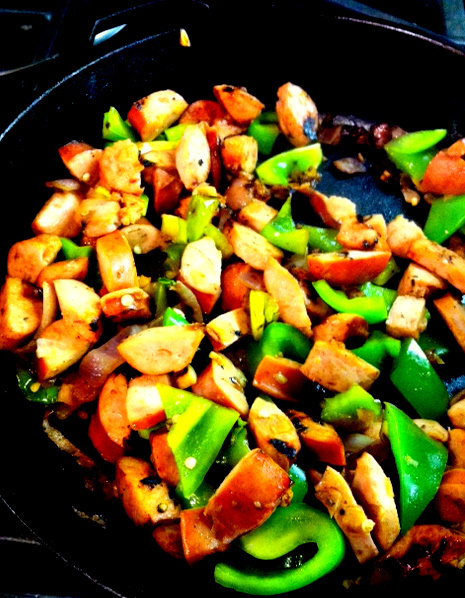 Add garlic, peppers and sausage, and cook until peppers soften, 5 minutes. Mix in thyme and allspice, stir and cook 1 minute. 3. Cook your brown rice til somewhat soft. 4. Add rice and all ingredients and put in slow cooker on high for 4-6 hours or on low 6-8 hours. We enjoyed this with a loaf of batard Sourdough bread purchased at my favorite local grocery called The Pasta Shop on College Ave in Oakland. It’s nice to serve the soup with Sourdough because the bread soaks up the juices like a sponge. Add a pinch of margarine (or you can use butter) which tastes absolutely flavorful and melts in your mouth. 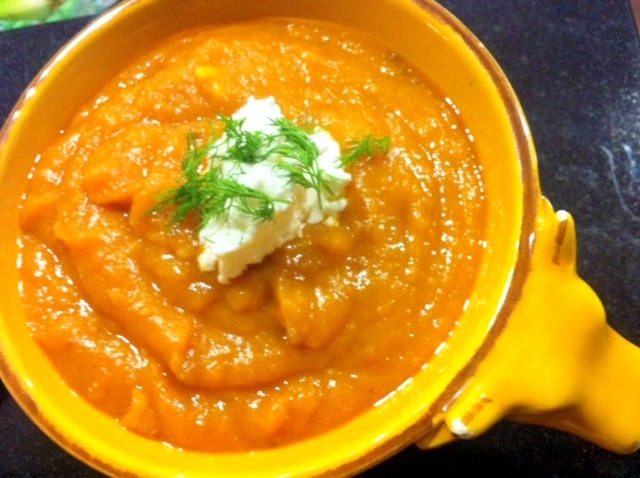 Looking for a soulful and soothing soup for cold winter nights? Look no further. This Butternut Squash recipe is incredibly easy to make, not to mention satisfying for the taste buds. It is sure to win over any dinner guest and it’s a great way to feed a small group of friends given how few ingredients this dish requires. 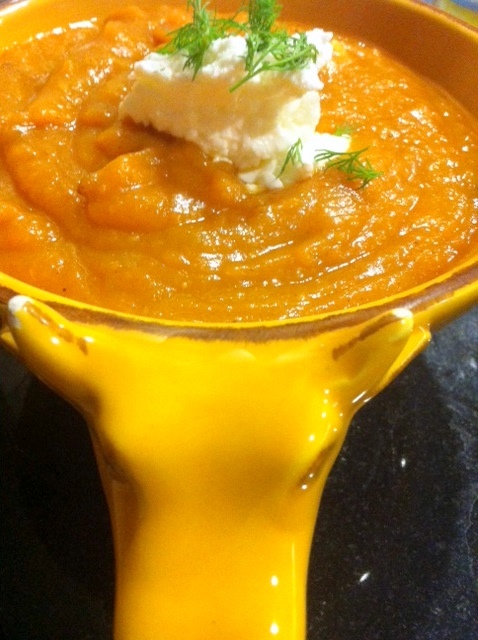 This Butternut Squash soup is a perfect recipe for a dinner party, or as a starter for Thanksgiving dinner. Jacob and I go to the Grand Lake Farmer’s Market pretty much every Saturday without fail. When you buy local and cook seasonal, everything tastes better. If you go to any farmer’s market this season you will start to see butternut squash, pumpkins, broccoli rabe, pears, crab apples and more! I love fall don’t you? In an effort to eat healthier, I’m now the Soup (Wo)man. 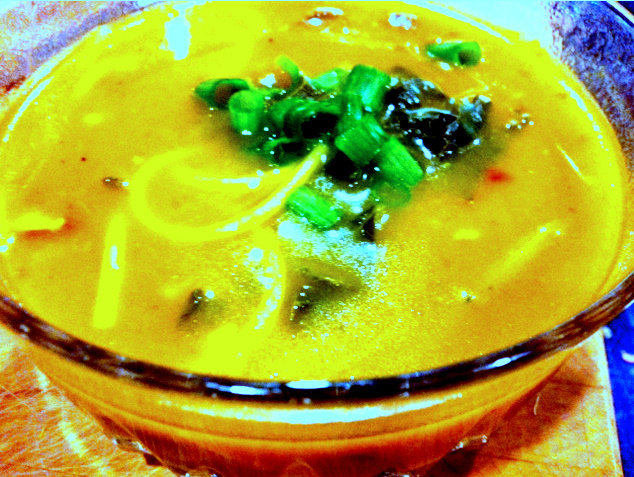 Soup is very filling, and according to Runners Magazine it’s a great choice after a long run. 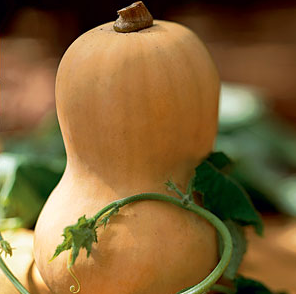 Butternut Squash Soup’s name represents its flavor profile. This Butternut Squash recipe is velvety, creamy and contains no butter (unless you prefer to use butter instead of olive oil). Either way! Jacob doesn’t generally like “sweet” food but he loved this soup. It’s not too salty and not too sweet. Indulge your senses! 1. Put large soup pan on medium-high heat, and carmelize onions in olive oil and garlic. 2. Add in your butternut squash, and all other ingredients. 3. Cook on medium heat for about 45 minutes or until cubes of butternut squash are soft. 4. Allow soup to cool. Puree in blender or food chopper until smooth. 5. Serve with dollop of yogurt, and a small piece of fennel on top. Moo Shu Rolls are really fun to eat, and for anyone on a high protein low carb diet, this is an appetizer for you. We use lean meats so in order to make the dish taste good you will need to make sure you add plenty of spice and flavor, and use a slow cooker that soaks up all the good juices. Moo Shu Rolls are fun to eat and a satisfying balance of salty sweet. 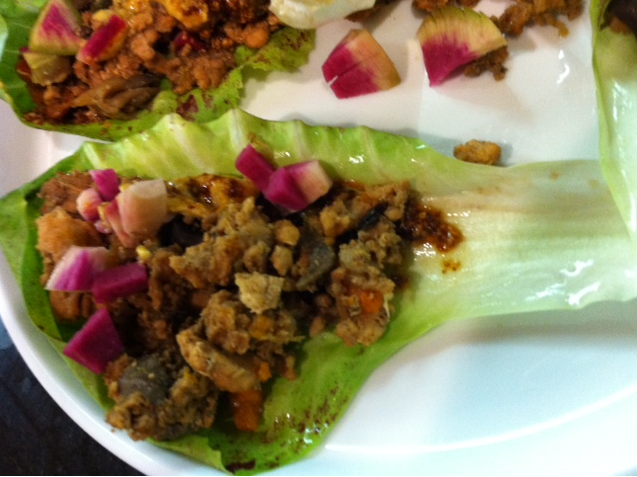 The meat is a little salty, and the bibb lettuce provides a sweet crunch. This recipe was adapted from this Slow Cook It recipe book. 1. Combine beef, mushroom, onion, and garlic in a 5 or 6 quart slow cooker. Mix broth, soy sauce, vinegar, ginger and five spice powder in small bowl; pour over beef mixture. Cover and cook until flavors are blended and sauce is slightly thickened, 4-5 hours or 8-10 hours on low. 2. Spoon 1 generous tablespoon beef mixture in center of each lettuce leaf. Top each with about 1 tablespoon carrots, 1 tablespoon scallion and 1 tablespoon radishes; roll up. I served this dish with a dollop of smoky hot grain mustard and the Trader Joe’s aoli mustard. You also might want to add a yogurt based sauce. Per serving (2 rolls) about 94 calories, 3 g fat, 1 g Sat Fat, 0 g Trans Fat, 27 mg Chol, 144 mg Sod, 5 g carbs, 11 g Prot, 1 g Fiber. You know what I love about food blogging? I love that it’s 3:30pm and today I feel like writing about food–and I can do that. This is one big thing I’m grateful for. Now that we’ve gotten my gratitude out of the way, let’s get to the cupcake! The other night we were having guests for dinner. And instead of trying to make everything from scratch I dressed up a Trader Joe’s baking mix and made it into a playful and decadent Halloween pumpkin cupcake. I loved putting these little creatures on top of my cupcake, largely because it’s creative. I LOVE to make things with my hands. If cupcakes were better for you I would do this every day. 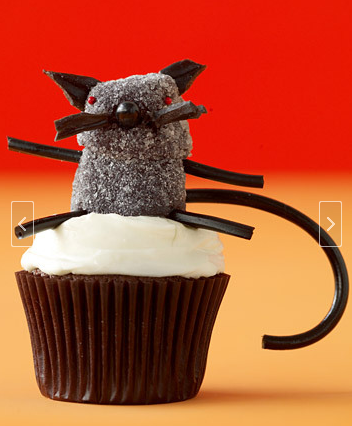 The little guy below was my inspiration for my Halloween cupcake. Making these ugly little Halloween creatures made me really happy. For 20 minutes as I fumble with toothpicks and candy, I am 12 again. Play is something we all need in our lives. None of us is one dimensional. This is my multi-dimensional self debuting. My scary Kitty cupcakes–Chocolate Chip Pumpkin Pecan yummy-ness. This is the keeper of the kittens, Mr. Pumpkin Persimmon [I realize this probably seems very childish, but I don’t care]. 1. Preheat oven to 400 degrees. In a big bowl mix cake mix, eggs, oil, pecans, and water. Mix til the dough doesn’t have any bumps in it. Spray muffin pan with your pam spray. Pour an equal amount of your mix into the cups. Bake for 18-20 minutes at 400. Continue to check oven after minute 14 or so as all ovens bake differently. Don’t want to burn the cupcakes! 2. Take the cupcakes out of the oven. The cupcakes should slide out easily. Allow cupcakes to sit and cool. Set aside and take out candies. Stick one toothpick down two black gumdrops. Break one gumdrop in half for the head. Break up the black licorice and stick the licorice with toothpicks for ears, arms and tail. 3. 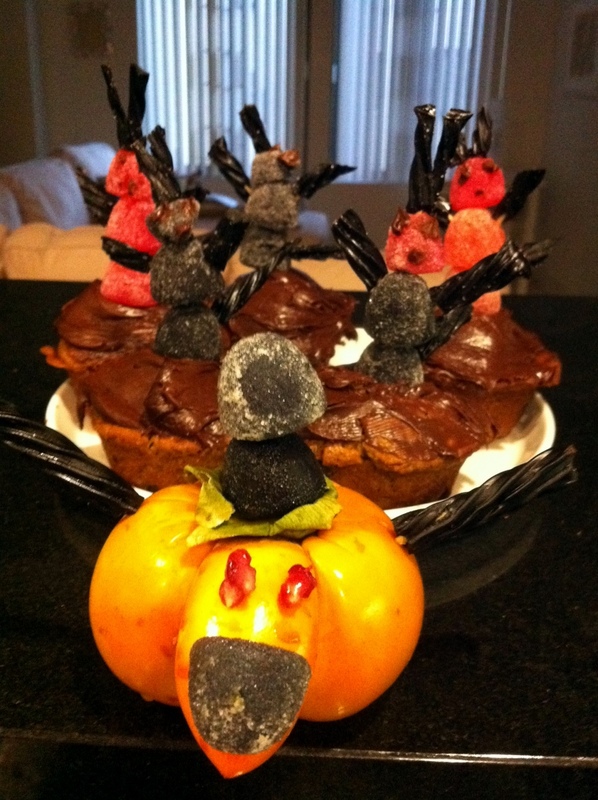 Once cupcakes have cooled, dress with your chocolate frosting and stick your figurines on top. Now all you need is some quiet time to enjoy this treat. On the other hand, enjoy with some friends so you don’t eat them all yourself. Remember to have fun and play. When you hear the term comfort food you probably think heavy, caloric, fatty…. But that’s simply not the full story. Eating comfort food on a cold winter day can be just what the doctor ordered–especially after a day of hiking, running or anything that’s appetite inducing. 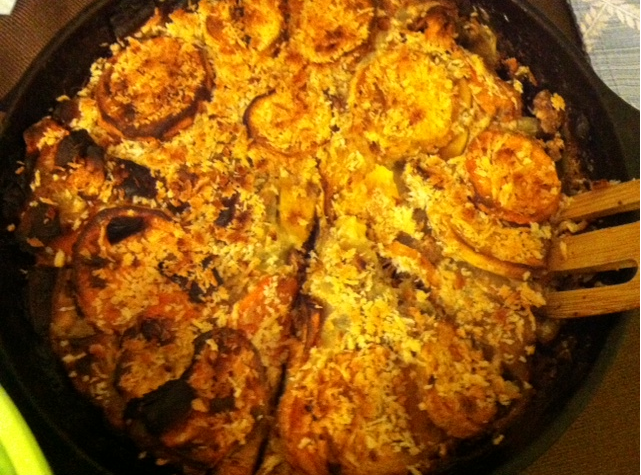 Most of us like comfort food–what you might call a Gratin. And anything baked or crusted goes in the comfort food category in my book! Gratin is just what the French call putting a browned crust on a dish using breadcrumbs, grated cheese or egg and butter. 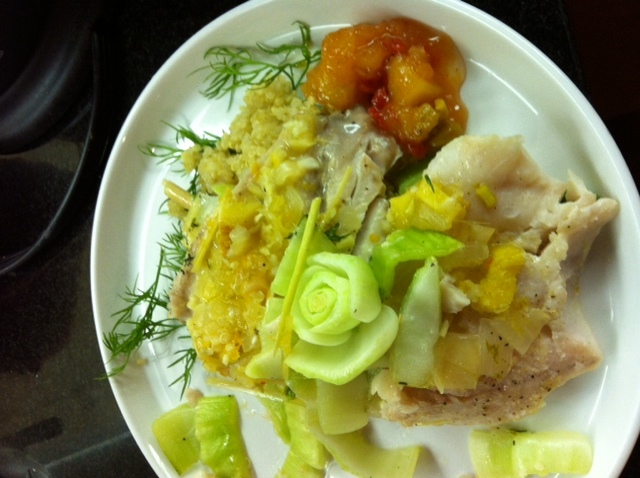 Last night–a pre-Halloween Saturday night meal–I got to cook for three wonderful people. I decided to use a recipe I grabbed from my favorite magazine Oprah. This one I took from the famous chef Wolfgang Puck who I mostly associate with the high-end version of “mall food” (thinking South Coast Plaza right now) but wins points with me for this deliciously cozy and easy to prepare recipe. I prefer things very crisp and browned as you can see. 1. Preheat oven to 375 degrees. Use either butter or spray to grease your 9 x 13 baking dish; set aside. In a large skillet over medium-heat, melt 2 tablespoons of your butter. Add your apples and cook stirring occasionally until caramelized. Let them cook for ten minutes. Meanwhile in a large bowl mix sweet potatoes with heavy cream, nutmeg (or pumpkin spice, salt, cinnamon and pepper. 2. Transfer half of sweet potatoes to prepared dish, arranging them in an overlapping pattern like a layered lasagna. Cover with apples, then remaining yams, overlapping with apples and more yams. Pour any remaining cream over the top. Cover with foil and bake until tender, about 45 minutes. 3. Increase oven temp to 500 degrees. Uncover dish, scatter bread crumbs over the top and dot with remaining tablespoon butter. Bake keeping a close eye on the grain in case bread crumbs burn. Cook until golden brown on top 8 to 10 minutes. Serve immediately. Makes 8 servings. Active time 30 minutes. Total time 1 1/2 hours.